Soon Available: A Complete Kit for those of you without OEM lights. So, The LONG DEBATED cab light debate. Forgive me as I do not have a factory cab light to compare it to in the photos, but I have attached a photo of a FACTORY cab light that I had painted that is installed on my F350. 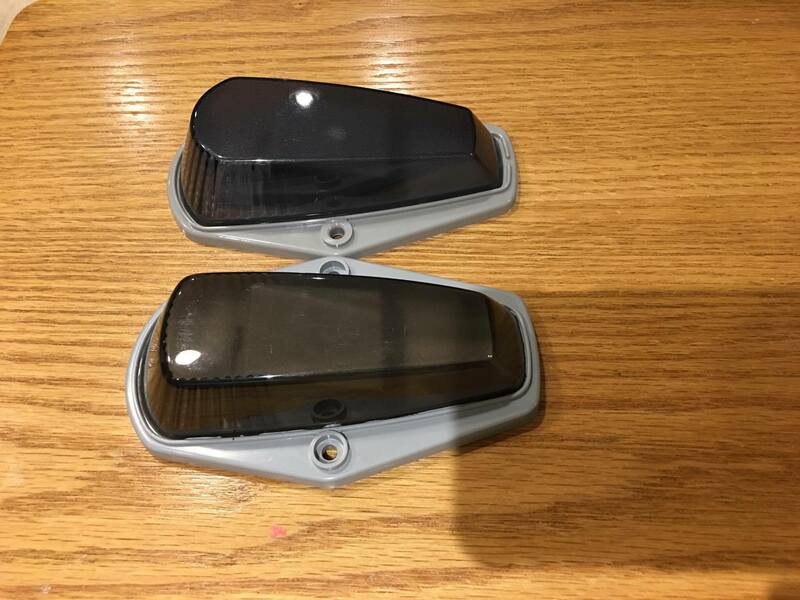 Lets get the details, On the LEFT/TOP is the eBay cab light, that you can purchase from eBay between $26.00 and $43.00. 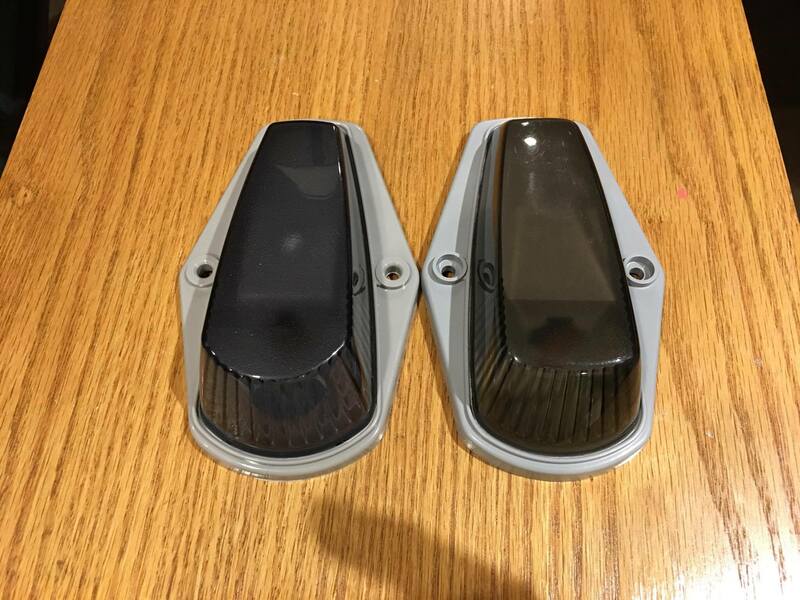 On the RIGHT/BOTTOM is the Complete Performance Cab light that you can purchase directly from Paul Rutledge or Chris Rutledge at Complete Performance for $80.00. 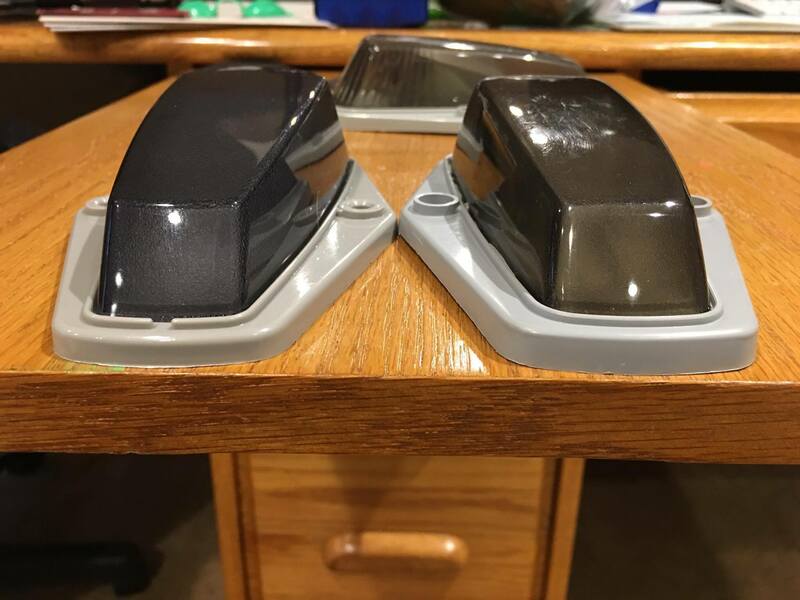 Both of these Cab Lights are "Smoked" in color. So, I will list the noticeable differences I've found between the two. 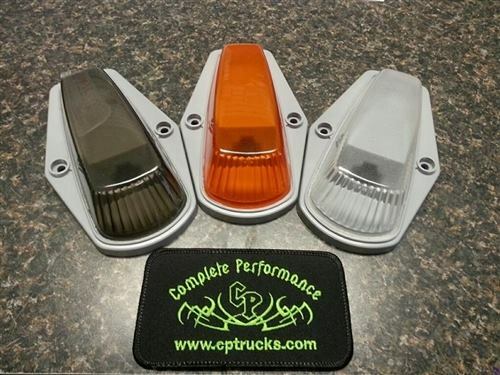 The First photo is all three colors available from Complete Performance, which includes a Factory cab light in the middle. The Second photo. You can see the color difference here, the eBay one is more bluish/purple. The CP one is more of a brown, which if you've ever smoked lights using actual paint/clear, this is how they turn out. 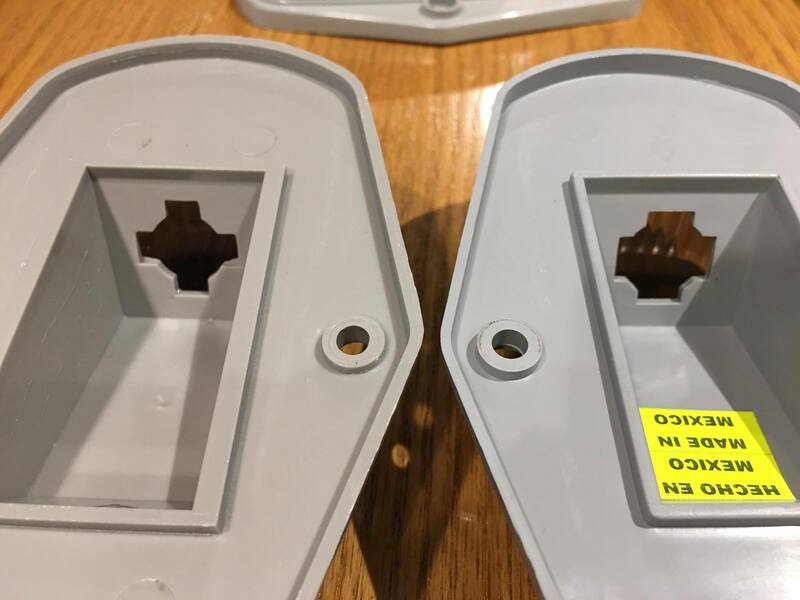 You'll also notice that the mounting holes are completely different. The eBay one sets the screws on top of the base, where as the CP one sets the screw down inside the base, like the OE one would be. Another thing to note is the actual shape of the lens itself. The eBay one is round, following the curvature of the base. 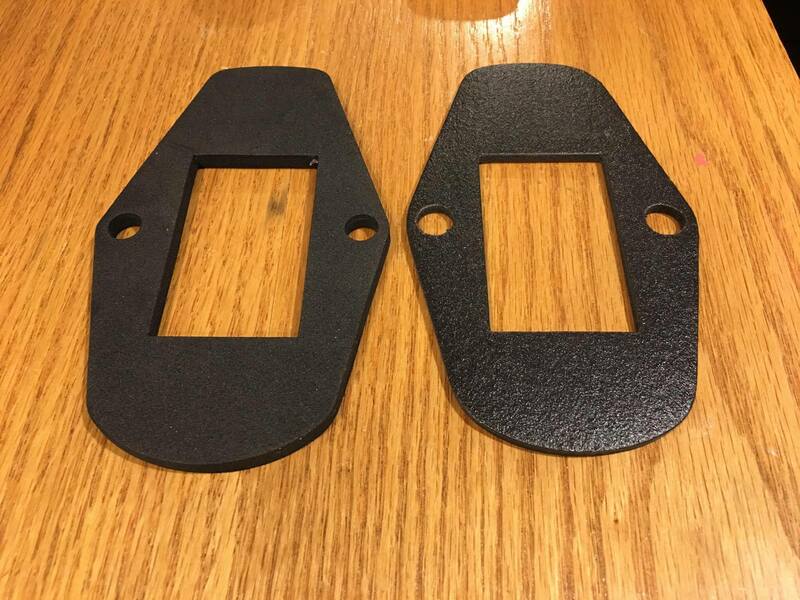 The CP one is flatter, just like the OE one would be. The Third photo reiterates what I stated above. 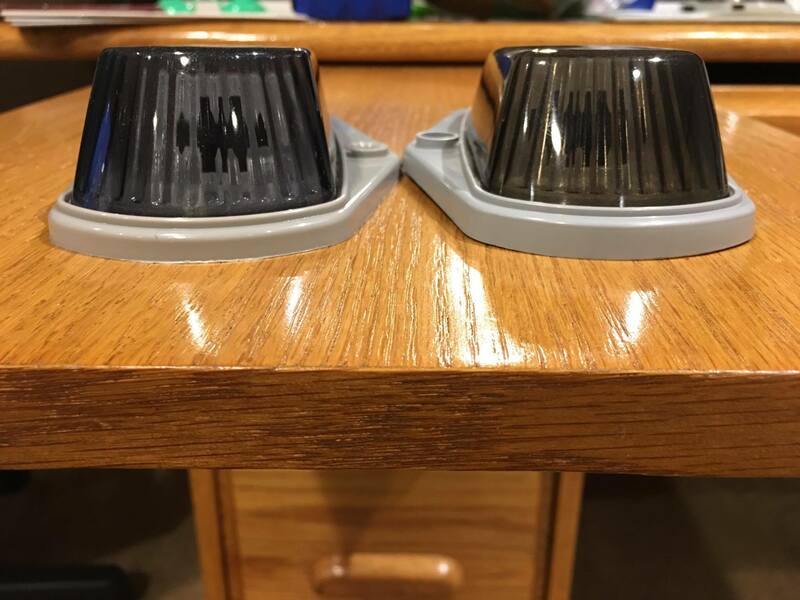 The Fourth photo shows the thickness of the bases, and if you look closely, you can see that the eBay one sits FLAT on the desk, and the CP one actually has a curve to the base. If you remember, the roof on your truck is NOT flat. The Fifth photo reiterates the above, and you can also see they have added a drain to the back of the lens base. Which only means that they are expecting water to get inside the lens. 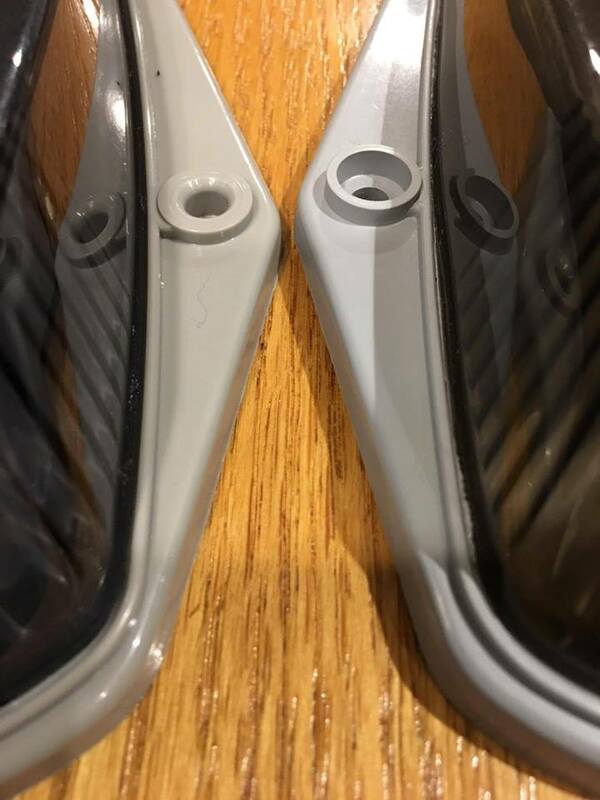 Ill bring this up now, but they both seem to be "plastic welded" together. But the CP one shows much more melting between the two. 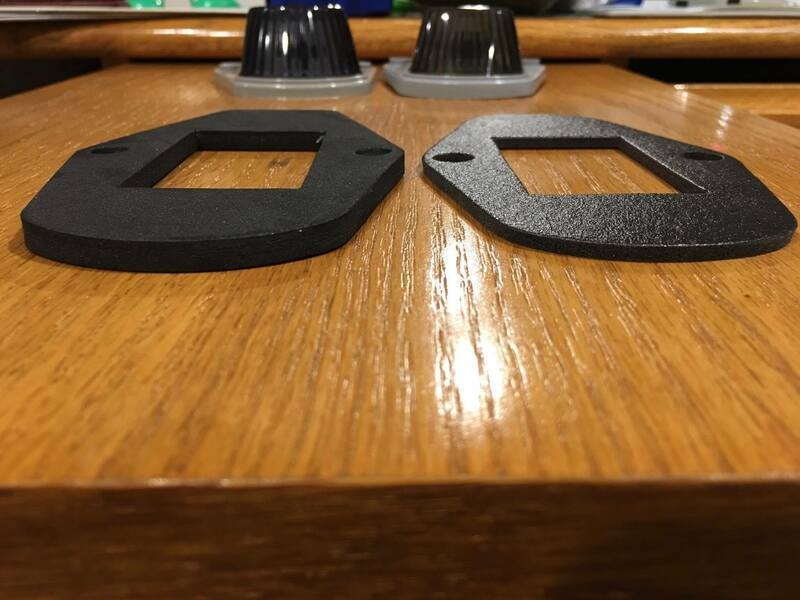 The Sixth photo shows the huge difference in the base thickness, and also highlights the shape of the base. CP wins again with the curved base. The Seventh photo highlights the major difference in the mounting holes. CP being exactly like OE. The Eighth photo shows the light socket mainly. 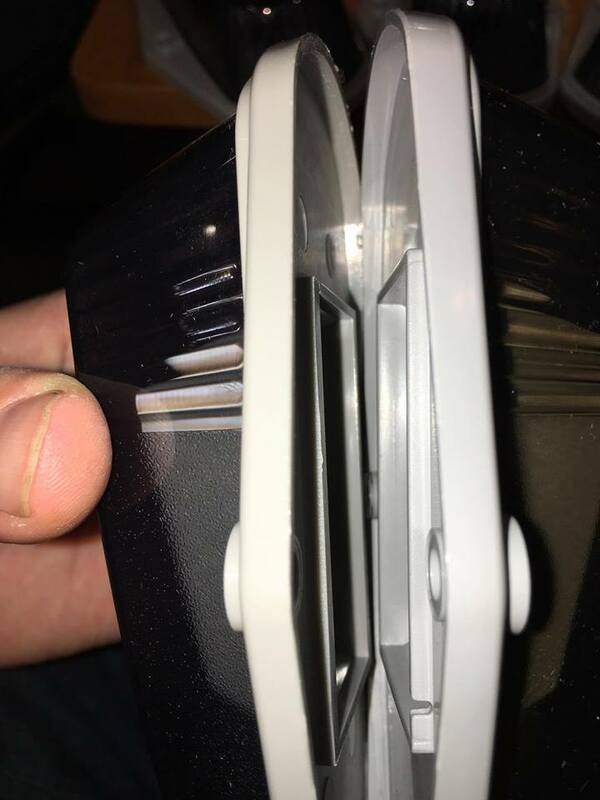 Notice that the eBay one has smaller openings for the socket to lock into? Nothing worse than your light socket not fitting into the light housing. I tried inserting a socket into the eBay one and had a difficult time getting it into it. I actually quit because I didn't want to break either of them. The CP one also has a made in Mexico sticker on it. Not cheap Chinese plastic. The Ninth photo shows the whole Base. Note the color. The CP one is more grey, and the eBay one is more brown. Another note here is the notch in the base. For anyone that doesn't have factory cab lights, this lets the ground wire for the lights pass through to the screw as a ground. The Tenth photo. The mounting screws are lined up on both sides. You can see that the mounting square is actually set into a different place. This also changes the location of the bulb inside the lens. The Eleventh photo shows the seals. The eBay one is thicker, and a lot more dense. I don't see this type of foam actually creating a bond to the painted surface of the truck. The thicker foam will also stick out and be seen since the cab light isn't curved to fit the roof, which is also why I think its thicker... The CP seal is more of a smooth foam, much softer, and less dense. I could find this seal sticking to the paint much better, and creating a better seal. The Twelfth photo reiterates what I said above. The Thirteenth photo is my personal truck, with factory cab lights that I had smoked using black/clear paint. So, in review. You get what you pay for. The MAJOR thing for me is the curvature of the base. If it doesn't fit the roof, it doesn't seal. The thicker seal isn't going to make up for that flat bottom of the eBay light. The Cab light can rock on the roof since its mounted in the middle of the light. There are some differences that I pointed out that most wont even care about. But when you're going to fit AND finish, then it matters. The seal on the CP one is better. The Plastic itself on the CP one is better. I held both of them and flexed them both in my hands. The CP one was sturdy, while the eBay one had a some flex to it, followed by an interesting little creak. The mounting screws being recessed into the CP one is a big thing too. Most of the mounting screws don't look the best, and when people install them, they usually don't use stainless screws. Once again, about the fit and finish. The CP one is for sure 100% more OE than the eBay one. If I had to buy cab lights again, Id be giving Complete Performance a phone call. Ive been running their cab lights on my trucks for a few years now, with no issues. Bulb sockets went in good, no leaks inside the truck, they fit the roof nicely. Everything is good. Spend the extra money, couldn't be any more happy with this product, no issues with installation. It took about 30 minutes to put all of them on the truck and they work great and look great with led bulbs. I was skeptical about the price but you get what you pay for, these fit just like stock and dont bother with the Ebay ones, these are curved for these trucks and not flat. I like them so much I'm getting the smoked head and tail lights to match. If you're looking for cab lights look no further. 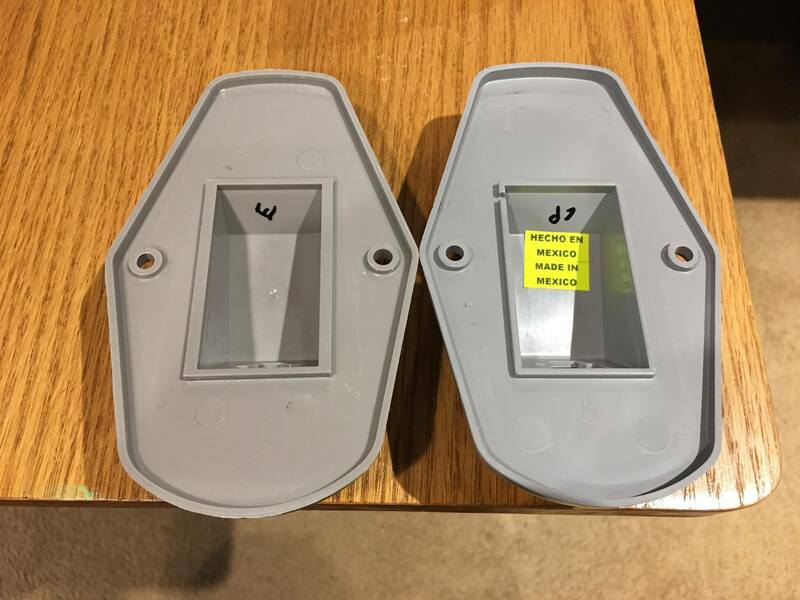 These are the best quality you can buy and fit the curvature of the roof which means they wont leak like other aftermarket cab lights. I've had a set for over 2 years and have no complaints. Don't Waste Your Time on eBay! If you're thinking of eBay lights for a little less money, don't waste your time. 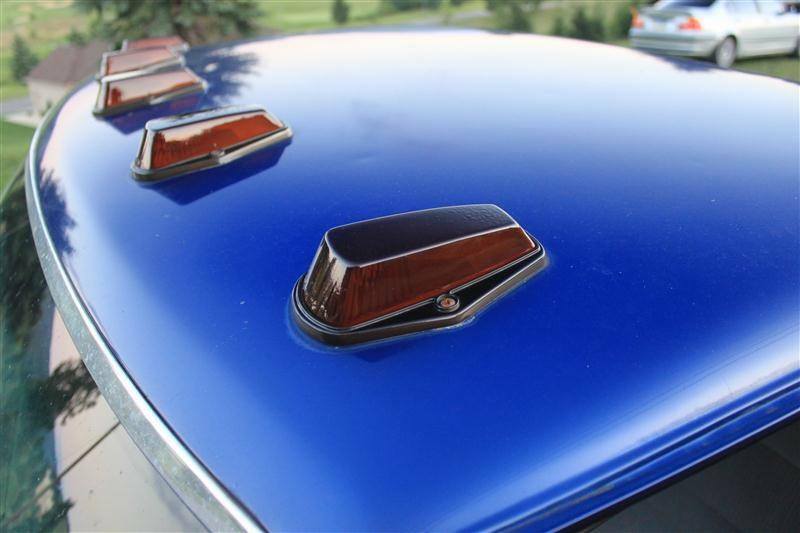 These have the proper curvature (yes, it's there...look closely) to match the roofline of your truck and as a result they seal much better. In my experience, other (cheaper) lights don't have it, and as a result they leak into your cab and make a mess. These seal properly, they look great, and give that "OE with a twist" look that I want.